Restaurante Victor’s (1955-2000s), founded by stockbroker Victor M Rubio in Tijuana, was the first to introduce and popularize his version of the now-classic carne asada al carbón to San Diegans. He ultimately had three locations. The first was his landmark restaurant on Boulevard Agua Caliente in the Marron area, topped with a large sombrero. You could order his tableside romaine salad and carne asada from a limited menu in the intimate ‘Carne Asada Room,’ which sat about a dozen tables. His downtown Tijuana restaurants were larger, cafeteria-style affairs that ‘catered to rapid self-service.’ They lasted until the 2000s. Victor’s Sombrero originally served a Caesar’s Salad, but as inflation ran wild in Mexico, they changed the recipe up, using local ingredients. Before, Rubio had imported most of his staples from the U.S. Out of necessity, less expensive corn oil and queso cotija (‘Cotija cheese’) were substituted for olive oil and Parmesan. Anchovies were omitted altogether. Victor’s ensaladero Efraim Montoya credits Jose Fimbres (founder of Calimax, just across the street), Rubio and Victor’s chef Jose Guadalupe Moreno with the invention of the Victor’s salad. It then became Victor’s Salad, which you can still enjoy today, served at Caesar’s Restaurant in Tijuana. 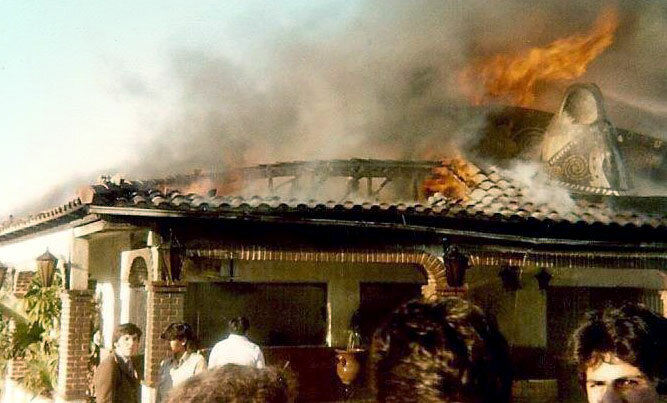 Fire at Victor’s Sombrero, Tijuana, 1980. Photo, courtesy Tijuana de mis Recuerdos. Restaurante Victor’s location today. Note the old brickwork at right. Do you have any information, menus or photos about these restaurants? Contact us here to share. Victor’s Salad, recipe from Victor’s Sombrero (1955-1980), Tijuana. Recipe for the original Victor’s Salad, from Restaurante Victor’s, Tijuana. The recipe below is based on that published in a 1972 cookbook. It has been modernized and quantities have been adjusted for the home cook. “first to popularize” Carne asada is so engrained with San Diego’s culinary identity today, it’s hard to believe it was not mentioned in local English-language newspapers before 1955. “stockbroker” June Crosby, San Diego fare: An insider’s guide to San Diego area restaurants, La Jolla, CA: Crosstown Publications, 1972. “original Victor’s Salad” recipe comes from June Crosby’s 1972 book, before the recipe was altered as a result of the Peso devaluation of the 1980s. Today’s recipe from Caesar’s differs slightly. See also Jay Porter, ‘Just down the road: A taste of history,’ Edible San Diego, Winter 2011; and W Scott Koenig, ‘Gems of Baja: The Victor’s Salad in Tijuana,’ San Diego Red, 10 Dec 2015.